Audiences around the world go to see a Wes Anderson film for many reasons; imagination, creativity, wonder and most of all, amazement. A man who has crafted and added to, not only a branch of the film industry within the independent market, but an individual who arguable has his own genre of film, proves with his latest that you are able to make an independent success, commercial darling and fading animation style feature film revolutionary. After eight feature films which enrich the medium as a whole, Wes Anderson delved, for a second time, into the stop-motion foray with his ninth future film, and quite possibly his best yet with Isle of Dogs. You heard the rumours right? About Isle of Dogs? Sure, there are a ton of rumours, controversy and discussions about the auteur director’s latest film, both positive and negative (which we will discuss further into this review) including some fun facts that if you say the film’s title fast, it’s actually the equivalent of saying “I Love Dogs”, as well as arguments about cultural appropriation, hmmm. The fact of the matter is, first and foremost, Isle of Dogs is a film that pays tribute and homage to so many of the things that Anderson loves and holds very dear to his heart. From his love to canines, to his homages to legendary filmmakers and vanguards Hayao Miyazaki and Akira Kurosawa, to his love of stop-motion animation; Anderson’s second venture into stop-motion animation is a film anchored by his passions, as well as a TRUE film for dog-lovers everywhere. DISCLAIMER: NO ACTUAL dogs were harmed during the making of this film–fact! Nevertheless, don’t let the animation fool you, Anderson’s Dogs is as convoluted a story and themed complexly as any other of his films. A true underdog story, the film follows a young Japanese boy Atari (Koyu Rankin) and his odyssey to save his beloved guard dog Spots (Liev Schreiber), a short-haired Oceanic speckle eared sport hound, who so happened to be the first dog to be sent to Trash Island, a fictional land outside of Japan’s fictional Megasaki City twenty years in the future, although the story seems more relevant now than it may in twenty years [hopefully]. Trash Island was sanctioned by Atari’s mayoral uncle, Mayor Kobayashi voiced by Anderson collaborator, who also served as one of the screenwriters, Kunichi Nomura. Kobayashi, following an age old dynasty that transgresses from his farthest ancestors, with strong pro-feline beliefs, sets course to sanction a law to deport all dogs to Trash Island, blaming “snout-fever” and “dog-flu” as an incurable disease for its people, despite two scientists (Ken Wantanabe and Yoko Ono) on the verge of a medical breakthrough with the cure. “What ever happened to man’s best friend?” indeed becomes one of the driving forces of the film. While Atari steals one of his uncle’s jets, the mayor himself Kobayashi, who serves as the boy’s ward following his parents tragic death years before, become family members and foes overnight. Questions arise as to why Atari on a quest to save Spots and deliberately chooses to throw his comfortable life away, despite Spots being one-helluva cute dog? It hurriedly becomes apparent that not only was Spots Atari’s loyal companion, but the pup also served as Atari’s loyal and trusted doggie-gaurd, despite Atari’s hesitations at first. Fast forward some time and Atari’s crash landing onto Trash Island, a desolate, ugly, grungy and garbage-filled wasteland inhabited only by dogs, populated with the brittle bones of animal carcasses, leftover waste, as well as spoiled and half-eaten food of Japan’s Megasaki, the journey becomes a young man’s ode to self-discovery and his ultimate moral fibre. Anderson, who so wonderfully, brings to life fantastical worlds in true Wes Anderson-esque fashion, seemingly chooses this story to showcase a very different side of his of his visual, truly allowing garbage, trash and waste to serve as a beautiful and poetic backdrop to his newest canon of films. Adding signatures such as Anderson’s symmetrical filming style, the use of pans and deep zooms, and Trash Island as well as the overly-populated Megasaki City fit right in with the rest of Anderson’s highly staged universe’s. 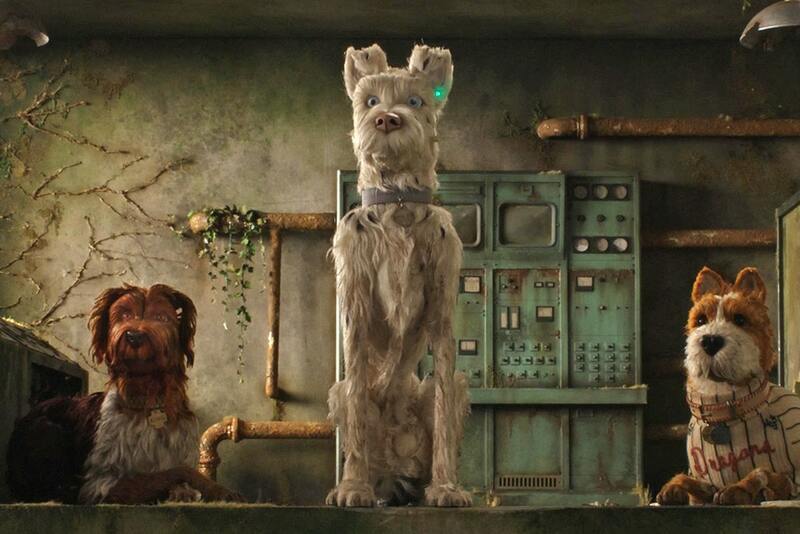 It also becomes quite easy to see that Anderson is also pioneering himself into cinematic prestige; using Isle of Dogs as his Avatar, progressing and improving stop-motion, maturing the visuals of the medium as well as mastering the ways of its presentation, especially comparing it side-by-side to his first venture with the form in The Fantastic Mr.Fox. Once on Trash Island, Atari comes into contact with five courageous dogs who unflinchingly help the young boy; the koy and spoiled celebrity dog King (Bob Balaban), the bumbling team mascot Boss (Bill Murray), the dextrous gossiper Duke (Jeff Goldblum), the rationale Rex (Edward Norton), and of course, the leader of the pact and mangy stray Chief (Bryan Cranston). Together, the six travel to the depths and deep dark corners of Trash Island to find Spots. But like any other ferociously Wes Anderson film, on their way, they encounter a plethora of obstacles, including; a crew of cannibal dogs, some violent, Kobayashi made robotic replacement dogs and other outcasts sentenced to the depths of an unlawful prison. All of these challenges between Atari and his rag-tag bunch of scoundrels push the limits of what they all thought they were capable of, paying special attention to the relationship between Chief and Atari in compassionate fashion. There are many beauties that encapsulates a Wes Anderson film, especially with each and every new entry to add to his exquisite filmography. The director/writer extraordinaire is truly evolving in his craft, experimenting with style, tone, narrative and themes like he has never done before in his earlier work. Sure, it can be argued that Anderson has difficulty with female protagonists and female characters in general, but luckily enough, he never tries to mask this; his confidence with unfolding strong male characters suffering with strong familial mis-steps never miss a beat. Anderson also has this sensible touch to integrate real-world current issues into his films, without ever really spending too much time analyzing or harping extensively on these issues. With the quarantine that all the dogs must face upon being banished to Trash Island, it becomes clear that Anderson’s allegory of real life politics, not just American, but worldwide, is being painted on, reflecting the state of these lovable human companions, to the current problems of immigration. Anderson’s subtle yet explicit subject matter in Isle of Dogs advances towards his cinematic style, sheding a light and ‘throwing-a-bone’ to a light-hearted yet extremely relevant subconscious audience that is never ever really acquitted of, but coerced towards enjoying a highly stylized and whimsical feature film experience with real-world issues surfaced. Visually, there is no exception to a Wes Anderson film. 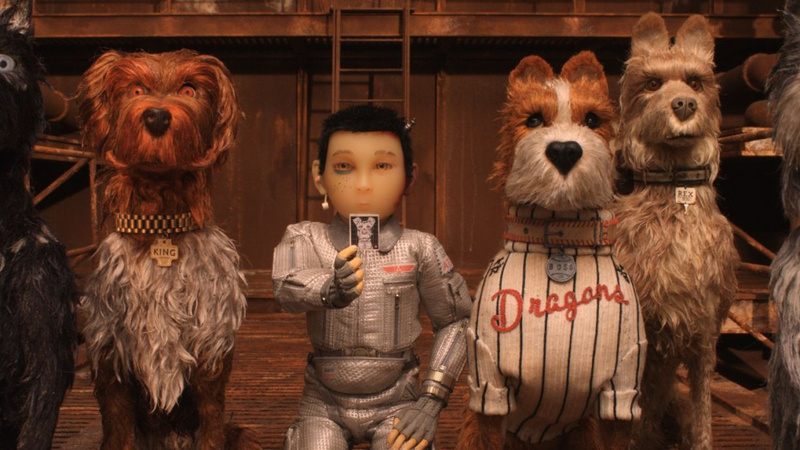 Never opting out or showing his films in 3D to gain extra profit, Isle of Dogs is a 2D feature film with NO two-dimensional characters; whether they have a tail or not. While the film itself is an ode to dog-lovers everywhere, its also a human narrative about the perseverance and endurance of the spirit of goodness and selfishness and the labours of love. As Rex points out in the film, Atari is the first human to come to Trash Island to find his dog, hence why the raggedy group of dog misfits agree to help the young boy find Spots, including Chief, even though he has never been with a family or owner long enough to know what love is. As Chief proclaims, “I am not a violent dog, I don’t know why I bite”, it becomes clear that Chief’s void for love for humans doesn’t stem from hatred, but rather from a lack of affection. Once Chief and Atari begin their journey together and share progressive moments with each other, the narrative truly showcases the wonders of companionship that make all other dog-films seem cliche by comparison. Isle of Dogs is one of the first near perfect films of 2018, undoubtedly. Right there beside Black Panther, the film is a true testament to the goodness of excelling cultural awareness and showcasing diversity. Yet, the day before the limited release date of the film, beloved and respected film critic Justin Chang wrote a review on Isle of Dogs speaking about the insensitivites of cultural appropriation in the film. While I am in no position to talk about the beauties of the Japanese culture since my ancestry doesn’t stem from any parts of Japan, nor have I ever been to Japan, I can offer my opinions based on the simple fact that I am also a film critic, dog lover, cultural enthusiast and human being. In Chang’s review, he speaks about Anderson’s ‘highly selective, idiosyncratic rendering’ of East Asia, as well as a failure of sensitivity. Furthermore, Chang goes on to discuss Anderson’s ‘weakness for racial stereotyping’, deeming Anderson’s take of the Japanese culture hurtful and somewhat violating. Other critics, upon Chang’s review, have questioned as to why Anderson set the film and Japan, and why certain characters speak Japanese with no subtitles, while the dogs ONLY speak English if they are in fact suppose to be from Japan, and why there is an American translator (Frances McDormand) only for the political segments of Isle of Dogs. Is this all too convenient and superlative to Anderson’s story being told? Firstly, it is in my sincerest opinion that, Anderson, who wrote the script of Isle of Dogs, with Japanese actor/writer Kunichi Nomura, as well as Roman Coppola and Jason Schwartzman, had no intention of the film being culturally insensitive or offensive. Nomura, who is of Japanese decent, had an integral part of the script’s fruition, as well as providing the voice of a major character in the film. Anderson’s Isle of Dogs, seems to be, for me, more of a celebration of the Japanese culture and all of the wonderful characteristics that make up its distinct and unique cultural footprint in the world, rather than a acting as mockery or Anderson himself being exploitative of the Japanese cultural or a Japanese attaché. Why was the film set in Japan? While many can speculate and wonder all they want, Anderson himself has come out saying that the film was an ode to so many of the wonderful Japanese influences of his life; from film, to food, to literature to music, all of these characteristics are embodied in Isle of Dogs in never intrusive, but magical ways. From Anderson’s depiction of sushi, to taiko drumbeats that interlude the film in so many appropriate accounts thanks to the evolving work of Oscar winning composer Alexandre Despalt, to the use of language as a benefactor to the development of the story, Anderson and company truly set out to make a film that showcases the beauty of the Japanese culture, never really misinterpreting it, misconstruing its meaning or relevance, and especially not mocking it or capitalizing from it by any means. The organic experience of audience members who do not speak Japanese, experiencing the same frustration, confusion and communication from Atari (who speaks Japanese) is another way in which human try to understand dogs; think of it as a way of bridging the gap of the common idiom of being ‘lost in translation’, and we must say, it works brilliantly. Also, let us not forget that, more than a third of the film’s voice cast is of Asian decent, including Ken Wantanabe who voices the scientist leading the way for a cure, our main protagonist Atari voiced by newcomer Koyu Rankin, as well as getting a role for one of the most relevant Japanese artists of our time, Yoko Ono. This thirty precent number speaks for itself and says a lot more that can be said for many other films that have been heavily accused of white-washing, including last year’s mess of a film Ghost In A Shell. Isle of Dogs is a celebration of a highly respected, prim and proper, as well as universally polite culture. Just like a tourist visiting a new country for the first time, taking pictures, writing journal entries and video-taping prominent moments of their trip, Isle of Dogs is a love-letter to so many of the special and important moments, memories and instances of a celebrated filmmaker, who uses his newest feature as a platform to thank this wonderful culture and all its exports, not belittle it, or eschew it, and definitely not tweak it. In 2018, one day, we can look back at this wonderful medium of film and truly say that filmmaking has evolved into a a wonderful means to enhance and educate the vary definitions of specific cultures that may not always be accessible to all people, at all times, in all areas of the world. Our focus as a very specific and respected society of film critics should not use our voice to shame artists for their vision, but empower them, encouraging them to continue telling stories about the exhumed works of deceased and living masters who once inspired us, in our youth and as adults. There are many instances, as a young Latino male, where I have seen films, works of art, cultural misappropriation has been EXTREMELY misguided, especially in milestone cinematic venture, whether praised critically, or commercially. From Blood In, Blood Out where the glorification of Latin culture is minimized to the sanction of being a good gangster/drug-dealer, to Al Pacino’s unforgettable turn as Tony Montana, a Cuban drug-Lord who rules South Miami and sees wealth as his only measure of success, to other films, including critically acclaimed or Oscar nominated films such as Sin Nombre about the realities of immigration in Latin America and the harsh truths of cartels from my home country of El Salvador, to City of God about the brutal realities of life in Rio. Isle of Dogs may be a white American’s film perspective and rendering of a culture that he was not fortunate enough to be born into, but let us not shut-down the beautiful exploration of human being who are curious and inspired by culture, and embrace it, allow it to empower them, and are brave enough to create art to share it with the world which enriches it. At the end of the day, Isle of Dogs is a humanistic story about the bond between man and animal; the lengths people will go for that love, and most of all, a celebration of the [literal] underdog. The film highlights the power of unity, the idea of championing their fight what they believe in so very much that will further evolve the human spirit, and not desecrate it. If you haven’t already been able to tell, I absolutely fell in love with Isle of Dogs, for so many reasons, including and not limited to the fact that I am a true dog lover. Wes Anderson crafted a plot-twisting, elaborate and wonderfully imaginative world full of beauty/ugliness and good/bad into an immersive, cerebral declaration to the basic want for human beings everywhere; love. Now wag your tails, get excited, and go see Isle of Dogs, and if you feel like writing a Haiku poem afterwards, why the heck not? Night Film Reviews: 10 Out of 10!!!! Is Isle of Dogs the movie so far of 2018? Does it trump Black Panther? What did you think of the voice work? Leave your barking comments below!